With 100,000 printed and over 30,000 direct-mailed with 70,000 copies hand distributed throughout the Bay Area, your ad will be producing results over a full month before the Expo. Attendees preparing for the event will become familiar with your products or services, and even those who do not attend will have seen your ad in the Expo Program Guide as well. 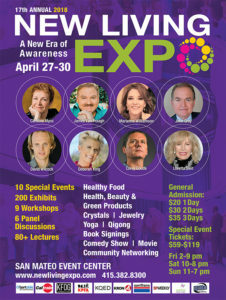 Each of the expected 15,000+ attendees at the San Mateo New Living Expo utilizes the Program Guide during the Expo. Your ad will focus attention on your exhibit and/or presentation and will highlight your participation at the New Living Expo. The Program Guide is often saved by the attendees as a valuable reference after the Expo. Your advertisement continues to work for you well after the event when you maximize your potential with an ad in the Expo Program Guide. The print date is in early March and the ad deadline is in mid-February. Send Original Digital Files! Technical questions? Call (415) 382-8300. All deadlines are February 15th 2019. Email: ken@newlivingexpo.com.